Screws, glasses, printing: The inventions of the Renaissance triggered a dramatic surge in development. Will digitalization have a comparable impact on modern society? 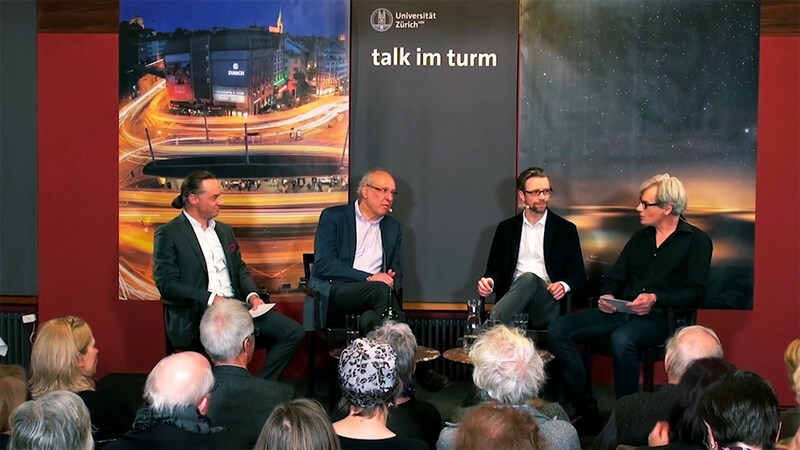 Historian Bernd Roeck and physicist Titus Neupert debated the question at UZH’s Talk im Turm podium discussion. “The completing of a major book project is like the end of a love affair,” said historian Bernd Roeck at the Talk im Turm event. His monumental work about the Renaissance, Der Morgen der Welt (The Dawning of the World), has recently been published. Writing it took Roeck 10 years. The result is a 1,300-page comprehensive journey through an epoch that seems to us today both fascinating and strange, despite the fact that it lay the foundations of modernity. Titus Neupert, meanwhile, claimed that as a physicist, he had no interest in writing such a weighty tome. Physicists aim to present their findings in formulations that are as concise as possible: “In physics, small is beautiful.” Neupert researches quantum effects in solids at UZH. He’s also involved in the development of quantum computers. These, he promised, would be much more efficient than today’s digital computers. Time was the topic of this Talk im Turm, which was chaired by Roger Nickl and Thomas Gull. Historian Bernd Roeck described how people’s perception of time had changed over the course of history, and Titus Neupert explained what modern physics had learnt about time since Einstein – namely, that there is no objective reference for time. How quickly time goes by depends on how quickly the observer is moving – the higher the speed, the slower the time goes. At the speed of light, time stands still. Like much in modern physics, the relationship between space and time is difficult to explain because it lies outside the scope of human experience. Explaining the inexplicable was one of the greatest challenges in physics, said Neupert, and metaphorical images were indispensable for such explanations. Some of these metaphors – for example the Big Bang, black holes, white holes, and wormholes – have found their way into popular culture and inspire the collective imagination. Who wouldn’t like to one day travel through a wormhole into the future? Einstein’s theory of relativity shattered many of the ideas underpinning everyday life, including the concept that time moves at a uniform rate. This idea of a linear time was itself once revolutionary, coined in the Renaissance. In ancient and medieval times, cyclical or salvation-historical apocalyptic concepts of time had dominated. The transformation of such concepts was caused by the increased availability of mechanical watches: Their regular tick-tock seemed to symbolize the linear flow of time. At the time of the Renaissance, Europe saw, according to Roeck, an explosion of knowledge like never before seen in the world. Renaissance scholars didn’t just rediscover the wisdom of antiquity, but also generated a lot of new knowledge. Inventions such as screws, glasses, and double-entry bookkeeping paved the way for a multitude of further innovations. The face of society began changing at a faster and faster pace – the middle ages were over.